Three students were chosen to represent the 6th grade in receiving the Teddy Roosevelt Maine Conservation Award for our class. Along with their teachers, Mrs, Nye and Mrs. Seaver, they travelled to Unity College on Friday, April 13th, for a roundtable discussion and award luncheon sponsored by Maine Woods Forever. 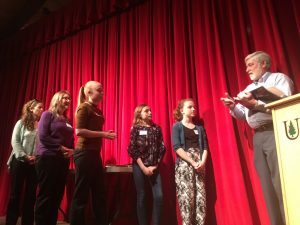 They received the award for their work on the Goosefare Brook last fall and asked the students to speak about what they had done. Casey Zecchinelli, Abby Roy, and Jazmin Booth did an amazing job describing the work they did and the projects students came up with to share their learning with the community. 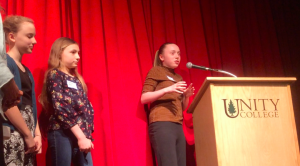 The adults in the audience were incredibly impressed with our students’ eloquence, poise, depth of knowledge, and their potential to be future environmental leaders. We are very proud of your hard work 6th graders!